Treasury warrant to Sir Robert Cotton and Thomas Franckland [Commissioners for the office of] [Postmaster General to pay [out of the Post Office revenue] 823l. to Capt. Richard Tye and other the owners of the Fran[cis] ketch as the appraised value of said ketch, which John Wildman, late Postmaster General, by agreement dated 1689, June 21, contracted to purchase for the King as a pacquet boat [to go] for Holland, with covenant to pay the appraised value thereof if sunk or taken by the enemy : it appearing that at the latter end of March last the said ketch, having the mail on board, was set upon by a French man of war and after five hours' fight was taken and carried into Dunkirk. Money Book XI, p. 96. Money order for 45l. 8s. 4d. to William Wardour, Clerk of the Pells in the Receipt, for one year to June 24 inst. for attendance in vacations and in lieu of the sums of 26l. 13s. 4d. and 8l. 15s. 0d. per an. anciently allowed him by tally on the Customs. Order Book III, p. 183. Same for 10l. to Jo[h]n Lowe, gent., one of the Deputy Chamberlains of the Receipt, for 1691, June 24 quarter, on his allowance for locking up and delivering out his Majesty's treasure. Ibid. Same for 100l. to same for same year for his pains in attending the Treasury Lords. Ibid. Henry Guy to the Earl of Ranelagh. I have read to my Lords your report of May 18 last on John England's petition for renewing his contract for serving bread and beer to Chelsea Hospital. My Lords agree to your said report and desire you to renew the contract with him in the manner you propose. Out Letters (General) XIII, p. 82. Same to the Customs Commissioners to report on the enclosed papers [missing] concerning the impost of 2s. per hogshead upon tobacco exported from Maryland. Ibid, p. 86. Same to Mr. Clarke. There was lately consigned to you by Mr. Gregor of Truro a parcel of tin for their Majesties' use. You are to deliver same to the Commissioners for Coining Farthings and Halfpence of tin. Ibid. Same to the Customs Commissioners to report on the enclosed letter [missing] from the Earl of Nottingham, with a list [missing] of several persons who traded with France in or about March, 1688-9, contrary to their bonds given at the Custom House. Ibid. Same to the Commissioners [for the office of Postmaster General] of the Post Office, enclosing several proposals far settling a Penny Post in the country, together with a report made by Major Wildman and other papers relating thereto. Please report thereon. Appending : note of the said papers enclosed : (1) Mr. Frowd upon Mr. Dockwra's proposal. (2) Major Wildman's report on Dr. Chamberlain's proposal. (3) Proposal by Mr. Murray and Dr. Chamberlain for a Country Penny Post. (4) Geo. Blackbourn's proposal for setting up a Penny Post in the country. (5) Supplemental reasons to the petition of R. M[urray] and Dr. H. C[hamberlain] about Penny Post. (6) Mr. Dockwra's proposal concerning Penny Post. 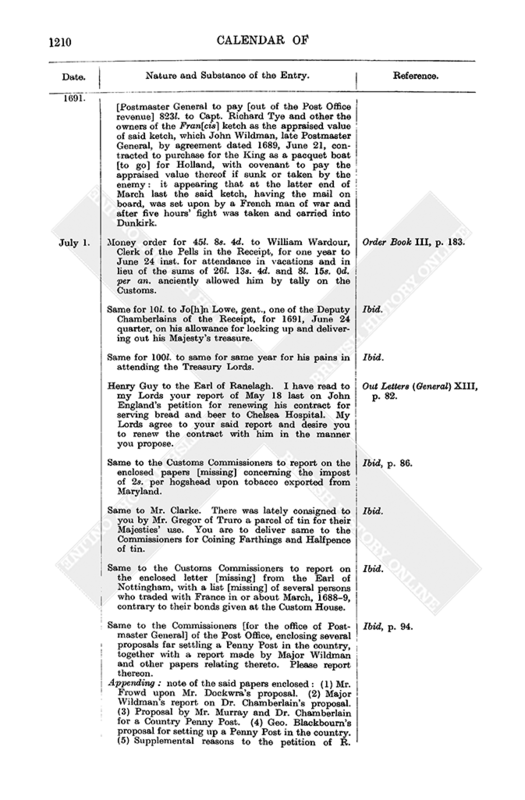 (7) A printed paper entitled an answer to a case printed by Mr. Dockwra. Ibid, p. 94. Royal warrant to the Attorney or Solicitor General for a great seal for a commission to James Hoar, Comptroller of the Mint, Andrew Corbet and Thomas Povey to be Commissioners for coining and issuing farthings and halfpence of tin : during pleasure ; according to rules already given or as they shall receive by Order in Council or under the sign manual : with a salary of 200l. per an. each as from June 24 last. King's Warrant Book XV, p. 404. Henry Guy to the Auditor of the Receipt to issue as follows out of disposable money in the Exchequer, except moneys particularly directed by the Treasury Lords to be reserved : viz. : Disposition Book IX, pp. 148-9. And out of the moneys of the 2s. Aid and Additional 12d. Aid. And out of the [sede vacante] temporalities of the see of Canterbury. Royal warrant to the Clerk of the Signet for a privy seal for 100,000l. to Francis, Visct. Newport, Treasurer of the Household ; as imprest and upon account for the ordinary and extraordinary services of the Household. (Money warrant dated July 9 hereon. This warrant quotes the privy seal as dated July 9.) (Money order dated July 10 hereon.) King's Warrant Book XV, p. 407. Money Book XI, p. 99. Order Book III, p. 186. Money warrant for 50l. to the churchwardens of St. James's, Westminster, for one year to May 19 last on the annuity for the poor inhabitants and orphans there. (Money order dated July 7 hereon.) Money Book XI, p. 99. Order Book III, p. 184. Treasury warrant to the Receipt for tallies on the First Fruits for 500l. to Aubrey, Earl of Oxford, for last June 24 quarter on his pension. Money Book XI, p. 99. 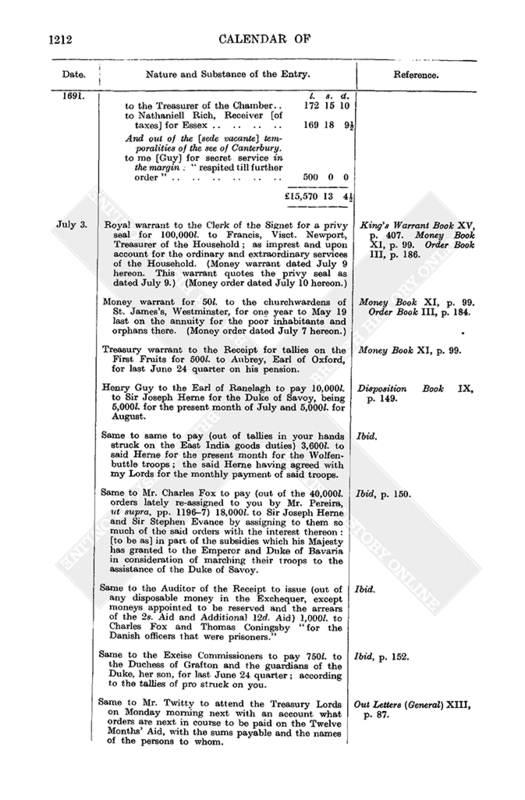 Henry Guy to the Earl of Ranelagh to pay 10,000l. to Sir Joseph Herne for the Duke of Savoy, being 5,000l. for the present month of July and 5,000l. for August. Disposition Book IX, p. 149. Same to same to pay (out of tallies in your hands struck on the East India goods duties) 3,600l. to said Herne for the present month for the Wolfenbuttle troops ; the said Herne having agreed with my Lords for the monthly payment of said troops. Ibid. Same to Mr. Charles Fox to pay (out of the 40,000l. orders lately re-assigned to you by Mr. Pereira, ut supra, pp. 1196-7) 18,000l. to Sir Joseph Herne and Sir Stephen Evance by assigning to them so much of the said orders with the interest thereon : [to be as] in part of the subsidies which his Majesty has granted to the Emperor and Duke of Bavaria in consideration of marching their troops to the assistance of the Duke of Savoy. Ibid, p. 150. Same to the Auditor of the Receipt to issue (out of any disposable money in the Exchequer, except moneys appointed to be reserved and the arrears of the 2s. Aid and Additional 12d. Aid) 1,000l. to Charles Fox and Thomas Coningsby "for the Danish officers that were prisoners." Ibid. Same to the Excise Commissioners to pay 750l. to the Duchess of Grafton and the guardians of the Duke, her son, for last June 24 quarter ; according to the tallies of pro struck on you. Ibid, p. 152. 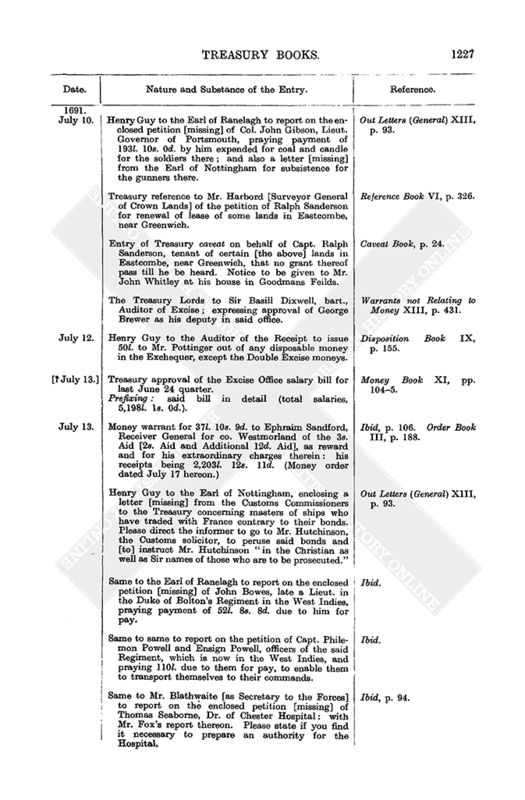 Same to Mr. Twitty to attend the Treasury Lords on Monday morning next with an account what orders are next in course to be paid on the Twelve Months' Aid, with the sums payable and the names of the persons to whom. Out Letters (General) XIII, p. 87. Henry Guy to Mr. Blathwayt [as Auditor of the Plantations] to report on the enclosed Order in Council [missing] made upon the petition of Lady Culpeper et al. touching a grant of lands in Virginia. Out Letters (General) XIII, p. 87. Same to same [as Secretary to the Forces] to procure a royal warrant, to be signed by the Queen, to authorise Charles Fox and Thomas Coningsby, Paymasters of the Forces in Ireland, to pay 1,000l. to Isaack Pereyra as a further weekly payment on account of his contract for waggon, horses etc., ut supra, pp. 1196-7. Ibid. Same to the Navy Commissioners. You have represented to my Lords that the moneys payable to the sick and wounded seamen are comprehended under the head of seamen's wages. You are to send my Lords an estimate of what you think will be a competent sum for that service, to be provided out of the money intended for the wages of the seamen. Ibid. Same to the sheriff of co. Northants to forthwith pay into the Receipt the 200l. fine imposed on Sir Charles Neale for speaking reproachful words against his Majesty : which fine my Lords understand is paid to you. Ibid, p. 88. Treasury warrant to Phillip Ryley, esq., Surveyor General of Woods, Trent South, to fell sufficient dotard and decayed trees in Sholebrook Walk in Whittlewood Forest to raise 50l. and 19l., or 73l. in all. And further to fell there two loads of timber and two coarse trees (not fit for the Navy) : all for the repair of the lodges, outhouses, pales, mounds, bridges etc. of said Walk : also to make reparations in Hasleborough Lodge, and the two Page keepers' lodges ; all in accordance with said Ryley's report of May 23 last on the petition of Sir Roger Cave, bart., Keeper of Sholebrook Lodge and Walk. Warrants not Relating to Money XIII, p. 427. Henry Guy to Sir Rowland Gwynn to pay as follows the 172l. 15s. 10½d. which was yesterday appointed to be issued to you at the Exchequer : viz. : Disposition Book IX, p. 150. Treasury reference to Sir Christopher Wren of the petition of Francis Negus, shewing that he is likely to be indicted for not paving the streets against the "Meuse" [Royal Mews at Charing Cross], pursuant to the Acts of Parliament ; therefore praying money [on account] for repairing and paving the said streets and likewise for payment of the bills stated in the account of repairs at the Meuse for the last year. Reference Book VI, p. 325. Royal warrant, under the Queen's sign manual, to the Attorney General to acknowledge satisfaction on record of the fine of 100l. imposed on John Prendergast, who was some time since convicted of being the author of a scandalous libel entituled The History of the Convention and sentenced to stand twice in the pillory, to find sureties for his good behaviour for seven years, to pay a fine of 100l. and to suffer imprisonment till the same were performed : all by reason that Prendergast has petitioned showing that he has stood in the pillory and given good security, but cannot pay the fine, which the Queen is pleased to remit. He is to be thereupon released from Newgate prison. King's Warrant Book XV, p. 407. Same to the Clerk of the Signet for a privy seal for 500,000l. to the Earl of Ranelagh as imprest for the pay and contingencies of the Guards, Garrisons and Land Forces committed to his charge. (Money warrant dated July 22 hereon. This money warrant quotes the privy seal as dated July 16.) (Money order dated July 24 hereon.) Ibid, p. 409. Money Book XI, p. 109. Order Book III, p. 190. Entry of Treasury consent for payment of the following bills of exchange "as they import" : styled in the margin "Code and Chisebden's [Chiselden's] bills" [as Agents for Maryland, being for Maryland duties, see supra, pp. 1081-5 and infra, pp. 1323, 1326]. Money Book XI, p. 97. Money warrant for 227l. 10s. 0d. to John Andrew Eckhart for three months, Mar. 26 last to June 25 last on his ordinary of 50s. a day as Resident at Brussels. (Money order dated July 7 hereon.) Ibid, p. 98. Order Book III, p. 184. Same for 273l. to Sir Paul Rycaut for three months, Mar. 27 last to June 26 last, on his ordinary of 3l. a day as Resident with the Hanse Towns. (Money order dated July 7 hereon.) Money Book XI, p. 98. Order Book III, p. 184. Appending : said bill, as allowed at Apperbaix June 25 last by Secretary Visct. Sidney : Money Book XI, pp. 98-9. Order Book III, p. 184. Henry Guy to the Auditor of the Receipt to issue to Charles Fox all the moneys remaining in the Exchequer out of the loans on the East India Goods Duties. If any thereof be in guineas you are to issue same at 1l. 2s. 0d. each. Disposition Book IX, p. 150. Same to same to issue to me [Guy] for secret service the 300l. of Hearthmoney which is reserved in the Exchequer. Ibid, p. 151. Same to Mr. [Charles] Fox to advance to Christopher Jenney, chaplain to the train of artillery in Ireland, 48l. 16s. 0d. on account of his pay. You are to signify this to [your co-paymaster in Ireland] Mr. Coningsby, so that he may take a regular discharge for same in Ireland "according to the establishment there." Ibid. Same to the Auditor of the Receipt to satisfy the 227l. 10s. 0d. to Mr. Eckhart, 273l. to Sir Paul Rycaut and 240l. 2s. 6d. to Visct. Dursley (ut supra, pp. 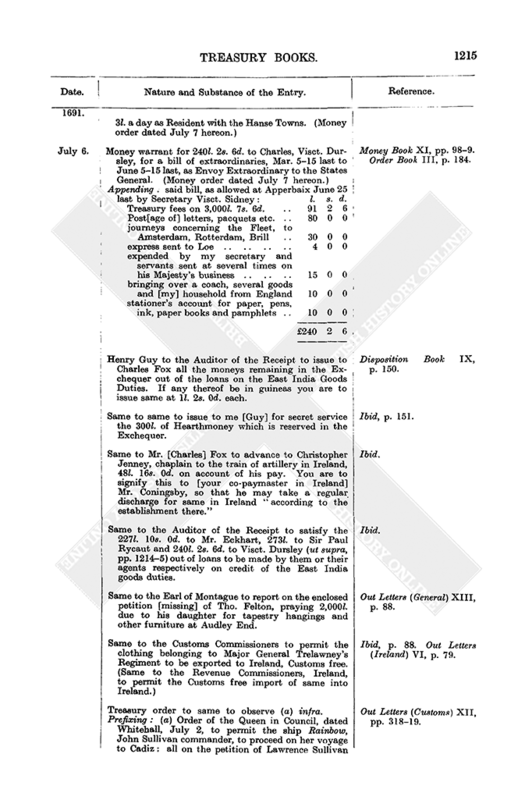 1214-5) out of loans to be made by them or their agents respectively on credit of the East India goods duties. Ibid. Same to the Earl of Montague to report on the enclosed petition [missing] of Tho. Felton, praying 2,000l. due to his daughter for tapestry hangings and other furniture at Audley End. Out Letters (General) XIII, p. 88. Same to the Customs Commissioners to permit the clothing belonging to Major General Trelawney's Regiment to be exported to Ireland, Customs free. (Same to the Revenue Commissioners, Ireland, to permit the Customs free import of same into Ireland.) Ibid, p. 88. Out Letters (Ireland) VI, p. 79. Prefixing : (a) Order of the Queen in Council, dated Whitehall, July 2, to permit the ship Rainbow, John Sullivan commander, to proceed on her voyage to Cadiz : all on the petition of Lawrence Sullivan and others, commander and owners of said ship, setting forth "that upon their giving security to cruise against the French the Rt. Honble. the Commissioners of the Admiralty have granted a letter of marque and protection for the said ship to go to Cadiz and cruise as aforesaid," but that the Customs Commissioners are unwilling to let her proceed without Treasury direction. Out Letters (Customs) XII, pp. 318-19. Treasury warrant to the Customs Commissioners to employ William Shole as a tidesman and boatman, Falmouth port, loco Jo[h]n Taylor, dismissed. Michaell Walmesly as waiter and searcher at Hastings in Rye port. Nathan[iel] Spencer as same at Emsworth in Chichester port loco Hedger, dismissed. Geo. Wellington as tidesman at Minehead loco William Fisher, who relinquished same. Geo. Ward as waiter and searcher at Polperro in Poole port loco Richard Pendock, deceased. Out Letters (Customs) XII, p. 319. 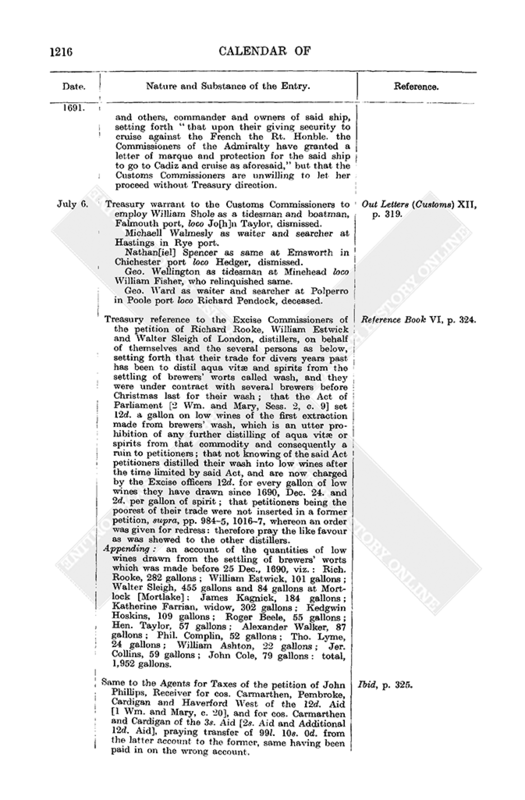 Treasury reference to the Excise Commissioners of the petition of Richard Rooke, William Estwick and Walter Sleigh of London, distillers, on behalf of themselves and the several persons as below, setting forth that their trade for divers years past has been to distil aqua vitæ and spirits from the settling of brewers' worts called wash, and they were under contract with several brewers before Christmas last for their wash ; that the Act of Parliament [2 Wm. and Mary, Sess. 2, c. 9] set 12d. a gallon on low wines of the first extraction made from brewers' wash, which is an utter prohibition of any further distilling of aqua vitæ or spirits from that commodity and consequently a ruin to petitioners ; that not knowing of the said Act petitioners distilled their wash into low wines after the time limited by said Act, and are now charged by the Excise officers 12d. for every gallon of low wines they have drawn since 1690, Dec. 24. and 2d. per gallon of spirit ; that petitioners being the poorest of their trade were not inserted in a former petition, supra, pp. 984-5, 1016-7, whereon an order was given for redress : therefore pray the like favour as was shewed to the other distillers. Appending : an account of the quantities of low wines drawn from the settling of brewers' worts which was made before 25 Dec., 1690, viz. : Rich. Rooke, 282 gallons ; William Estwick, 101 gallons ; Walter Sleigh, 455 gallons and 84 gallons at Mortlock [Mortlake] : James Kagnick, 184 gallons ; Katherine Farrian, widow, 302 gallons ; Kedgwin Hoskins, 109 gallons ; Roger Beele, 55 gallons ; Hen. Taylor, 57 gallons ; Alexander Walker, 87 gallons ; Phil. Complin, 52 gallons ; Tho. Lyme, 24 gallons ; William Ashton, 22 gallons ; Jer. Collins, 59 gallons ; John Cole, 79 gallons : total, 1,952 gallons. Reference Book VI, p. 324. Same to the Agents for Taxes of the petition of John Phillips, Receiver for cos. Carmarthen, Pembroke, Cardigan and Haverford West of the 12d. Aid [1 Wm. and Mary, c. 20], and for cos. Carmarthen and Cardigan of the 3s. Aid [2s. Aid and Additional 12d. Aid], praying transfer of 99l. 10s. 0d. from the latter account to the former, same having been paid in on the wrong account. Ibid, p. 325. Treasury reference to Mr. Harbord [Surveyor General of Crown Lands] of the petition of Thomas Neale for a lease of the manor and lordship of Denbigh, [he] being informed that there is a lead mine which he is willing to work at his own charge, with 10 per cent. [to the King]. Reference Book VI, p. 325. Entry of the Treasury Lords' signature of the docquet of a reversionary lease to Edward Tregenna and Peter Courtney at the nomination of Anthony Trethewy of [the land called] Sutton Pool, near Plymouth, co. Devon, for 13 years at 13l. 6s. 8d. per an. rent. Warrants not Relating to Money XIII, p. 428. Same of same of an in custodiam lease under the Exchequer seal to John Lamb of the manor of Buxhall, co. Suffolk, being part of the estate of Henry Coppinger, esq., outlaw, and of the annual rent of 80l., the annuity of Mary Coppinger, widow, outlaw : at a rent of 52s. 10d. and fine of 105s. 8d. Ibid. Treasury warrant to the Clerk of the Pipe for a lease to Jonathan Pentire of Boyton, co. Cornwall, of (a) the messuage or tenement called Dorset in co. Cornwall, containing 70 acres, and late in the tenure of Henry Parsons, being parcel of the manor of Boxton [Boyton] and of the late monastery of Launceston and now annexed to the Duchy of Cornwall : all as demised to Henry Seymour, esq., 1664, April 26, for 99 years, terminable on the lives of Henry son of Jonathan Trelawney : and of (b) a cottage in Boxton [Boyton] aforesaid, late in the tenure of Thomas Parsons, and demised to Thomas Parsons 1627, Nov. 30, for 99 years, terminable on the lives of Christopher, Mary and Blaunch Parsons. The present lease is to be for 99 years, terminable on the two lives to be nominated by said Pentire for the tenement and one life for the cottage in reversion of the existing terms, if any, therein and at the old rent of 20s. per an. for the tenement and 20d. for the cottage and fine of 50l. for the tenement and 40s. for the cottage. 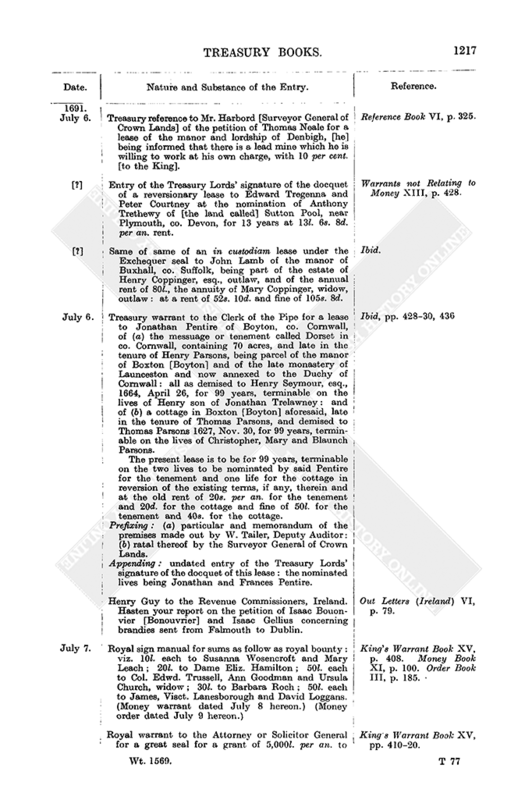 Prefixing : (a) particular and memorandum of the premises made out by W. Tailer, Deputy Auditor : (b) ratal thereof by the Surveyor General of Crown Lands. Appending : undated entry of the Treasury Lords' signature of the docquet of this lease : the nominated lives being Jonathan and Frances Pentire. Ibid, pp. 428-30, 436. Henry Guy to the Revenue Commissioners, Ireland. Hasten your report on the petition of Isaac Bouonvier [Bonouvrier] and Isaac Gellius concerning brandies sent from Falmouth to Dublin. Out Letters (Ireland) VI, p. 79. Royal sign manual for sums as follow as royal bounty : viz. 10l. each to Susanna Wosencroft and Mary Leach ; 20l. to Dame Eliz. Hamilton ; 50l. each to Col. Edwd. Trussell, Ann Goodman and Ursula Church, widow ; 30l. to Barbara Roch ; 50l. each to James, Visct. Lanesborough and David Loggans. (Money warrant dated July 8 hereon.) (Money order dated July 9 hereon.) King's Warrant Book XV, p. 408. Money Book XI, p. 100. Order Book III, p. 185. Royal warrant to the Attorney or Solicitor General for a great seal for a grant of 5,000l. per an. to John, Earl of Bath, as follows. Charles II appointed said Earl to be Groom of the Stole and, by virtue thereof, First Gentleman of the Bedchamber, and by patent dated 1661, Oct. 16, granted him an annuity of 2,000l. for life and by further patent dated 1669, June 1, granted him two further annuities of 2,000l. and 1,000l. for life. 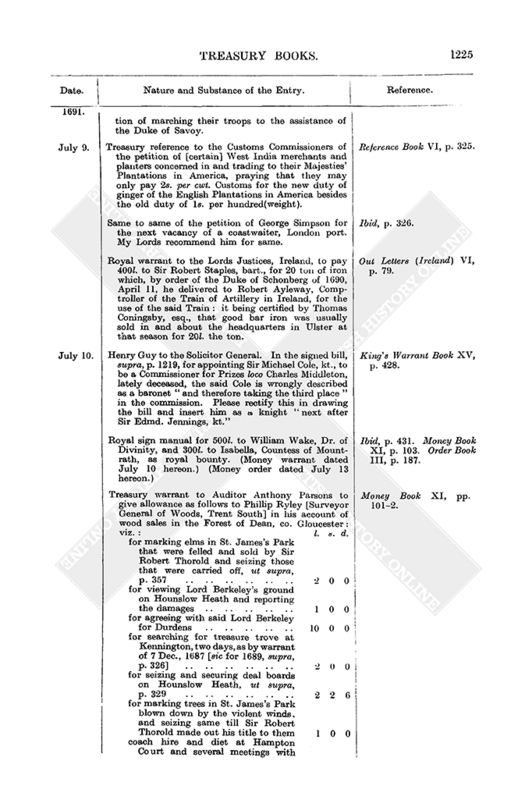 By deed dated 1691, May 11, enrolled in Chancery, said Earl has released and quit claimed to the Crown 20,000l. arrears due upon the said annuities for four years from 1684, Christmas, and has surrendered the said place of Master of the Stole and all rights under the abovesaid grants, but with a saving of the said annuities and the arrears due thereon before 1684, Christmas, and after 1690, Christmas. In consideration of such surrender and of the said Earl's many faithful services and former great sufferings the King hereby ratifies and confirms to him the abovesaid annuities of 2,000l., 2,000l. and 1,000l. as from Christmas last for his natural life : to be payable quarterly : and a moiety of said annuities and of the arrears thereon from Christmas last are to be charged on the General Letter Office revenue ; and the other moiety of said pensions and arrears are to be charged on the First Fruits and Tenths ; and the said moieties respectively are to be paid forthwith and from time to time in future by the Postmaster General and by orders or tallies on the First Fruits and Tenths and if either fund should fail for any reason then the deficit to be paid out of any money in the Receipt. King's Warrant Book XV, pp. 410-20. 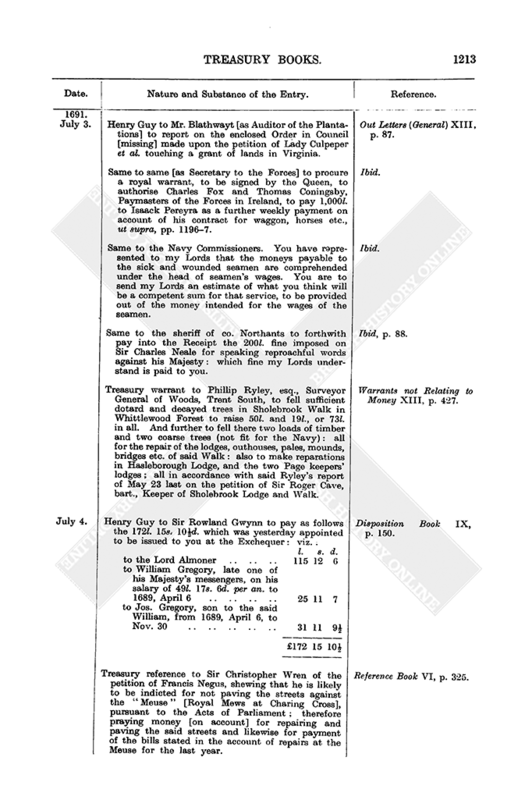 Royal warrant to Brook Bridges and Thomas Done, Auditors of Imprests, to allow to the Earl of Ranelagh in his Army account for the year ended 1690, Dec. 30 , the 5,200l. which he paid to meet a bill drawn on him 1690, May 23, by the King's command, by William Van Schuylenburg of the Hague for providing several quantities of arms at Liege. King's Warrant Book XV, p. 421. Same to same to allow to same in same account 412l. 11s. 0d. for moneys paid by him as follows by the King's directions : viz. : 200l. to Col. Thomas King as royal bounty ; 10l. to Mris. Prudence Cocken as same ; 43l. 10s. 10l. to Mr. Thomas Holford for painting and gilding 57 ciphers and crown on 57 drums and for 24 cases for the colours of the First Regiment of Guards ; 100l. to Capt. Thomas Phillips, who attended the Earl of Marlborough into Ireland as Engineer, as royal bounty ; 41l. 1s. 0d. to John Price for two chests of medicaments provided by him for the Forces which went with said Earl into Ireland ; 18l. 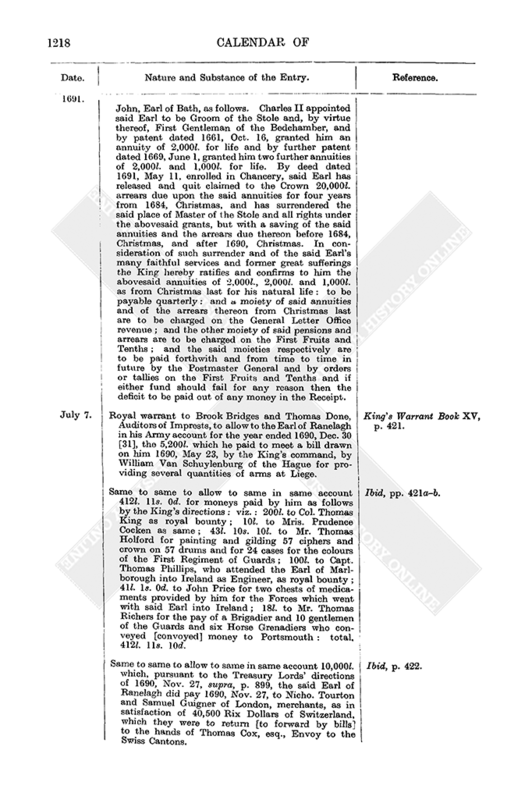 to Mr. Thomas Richers for the pay of a Brigadier and 10 gentlemen of the Guards and six Horse Grenadiers who conveyed [convoyed] money to Portsmouth : total, 412l. 11s. 10d. Ibid, pp. 421 a-b. Same to same to allow to same in same account 10,000l. which, pursuant to the Treasury Lords' directions of 1690, Nov. 27, supra, p. 899, the said Earl of Ranelagh did pay 1690, Nov. 27, to Nicho. Tourton and Samuel Guigner of London, merchants, as in satisfaction of 40,500 Rix Dollars of Switzerland, which they were to return [to forward by bills] to the hands of Thomas Cox, esq., Envoy to the Swiss Cantons. Ibid, p. 422. 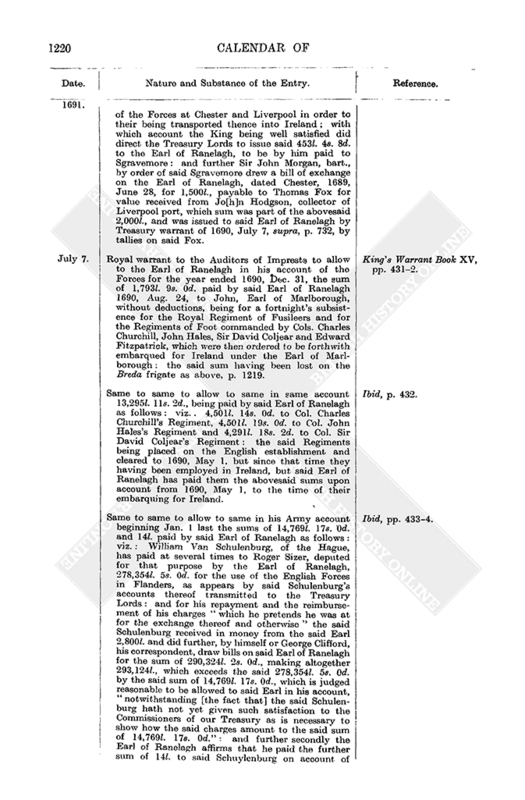 Royal warrant to Brook Bridges and Thomas Done, Auditors of Imprests, to allow to the Earl of Ranelagh in the Army account for the eight months ended 1689, Dec. 31, 171l. 12s. 8d. which said Earl of Ranelagh, by the King's special command, did pay to Capt. Nicho. Roope in satisfaction of so much disbursed by him in the King's service in and about the Castles of Dartmouth. King's Warrant Book XV, p. 422. Same to same to allow to same in the 1690 Army account the 3,200l. which by the King's direction of April, 1690, said Earl of Ranelagh did pay to the Earl of Melville, then High Commissioner for the kingdom of Scotland, which sum was paid accordingly [to] Mr. Nearne for the use of said Earl of Melville. Ibid, p. 423. Same to same to allow to same in the Army account for the year commencing Jan. 1 last 48,827l. 1s. 7d., which by royal direction the said Earl of Ranelagh did pay, without deductions, to Jacob Vander Esch. Appending : list of the 18 individual payments making up said total, the payments being approximately weekly from 1691, Mar. 30 to June 26. Ibid, pp. 423-4. Same to same to allow to Charles Fox in his account of the Forces in Ireland for the year ended 1690, Dec. 31, the sum of 1,070l. 11s. 0d., which by the King's direction he paid 1690, Aug. 24, to John, Earl of Marlborough, without deductions, being for a fortnight's subsistence for the Regiments of Foot commanded by Cols. Charles Trelawney, John Beaumont and Ferdinando Hastings, which the King then ordered to be forthwith embarqued for Ireland under said Earl's command, which sum of money being put on board the Breda frigate was there lost when she was blown up. The said Regiments are not to be charged with the said sum, they having not received any part thereof. Ibid, p. 425. Same to the Attorney or Solicitor General for a great seal for a fresh Commission for Prizes : the new Commissioners to be Philip Darcy, Sir Roger Langley and Sir Michael Cole, bart., Sir Edward Avscough, Sir Edmund Jennings, John Parkhurst and Robert Murray : with powers etc. as in the previous Commission, supra, p. 1147. The effect of this warrant is to substitute Sir Michael Cole for Charles Middleton, deceased. Cole's salary not to be paid till the arrears due to the executors of Charles Middleton have been paid. Ibid, pp. 426-8. Same to the Auditors of Imprests to allow to the Earl of Ranelagh in his account of the Forces for the year ended 1690, Dec. 31, the sums of 453l. 4s. 8d. and 1,500l. : it appearing that Sieur Sgravemore, Quartermaster General of the Forces, did by order of the Treasury Lords in 1689, take up several sums of moneys from the Customs Receiver at Liverpool and Chester amounting in the whole to 2,000l., of which he paid 600l. 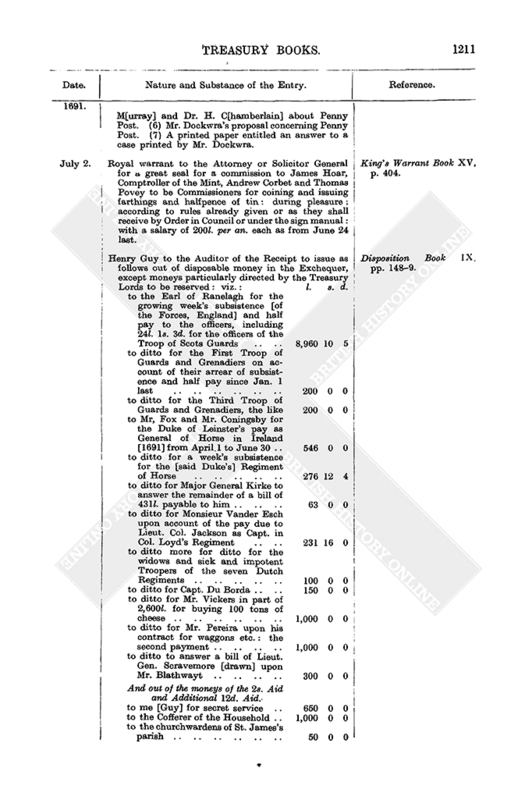 1689, Aug. 27, to John Shales, Commissary General of Provisions for the Army in Ireland ; and by an account exhibited by Sgravemore to the King it appears he expended not only the remaining 1,400l., but also the further sum of 453l. 4s. 8d. for the encampment of the Forces at Chester and Liverpool in order to their being transported thence into Ireland ; with which account the King being well satisfied did direct the Treasury Lords to issue said 453l. 4s. 8d. to the Earl of Ranelagh, to be by him paid to Sgravemore : and further Sir John Morgan, bart., by order of said Sgravemore drew a bill of exchange on the Earl of Ranelagh, dated Chester, 1689, June 28, for 1,500l., payable to Thomas Fox for value received from Jo[h]n Hodgson, collector of Liverpool port, which sum was part of the abovesaid 2,000l., and was issued to said Earl of Ranelagh by Treasury warrant of 1690, July 7, supra, p. 732, by tallies on said Fox. Ibid, p. 430. Royal warrant to the Auditors of Imprests to allow to the Earl of Ranelagh in his account of the Forces for the year ended 1690, Dec. 31, the sum of 1,793l. 9s. 0d. paid by said Earl of Ranelagh 1690, Aug. 24, to John, Earl of Marlborough, without deductions, being for a fortnight's subsistence for the Royal Regiment of Fusileers and for the Regiments of Foot commanded by Cols. Charles Churchill, John Hales, Sir David Coljear and Edward Fitzpatrick, which were then ordered to be forthwith embarqued for Ireland under the Earl of Marlborough : the said sum having been lost on the Breda frigate as above, p. 1219. King's Warrant Book XV, pp. 431-2. Same to same to allow to same in same account 13,295l. 11s. 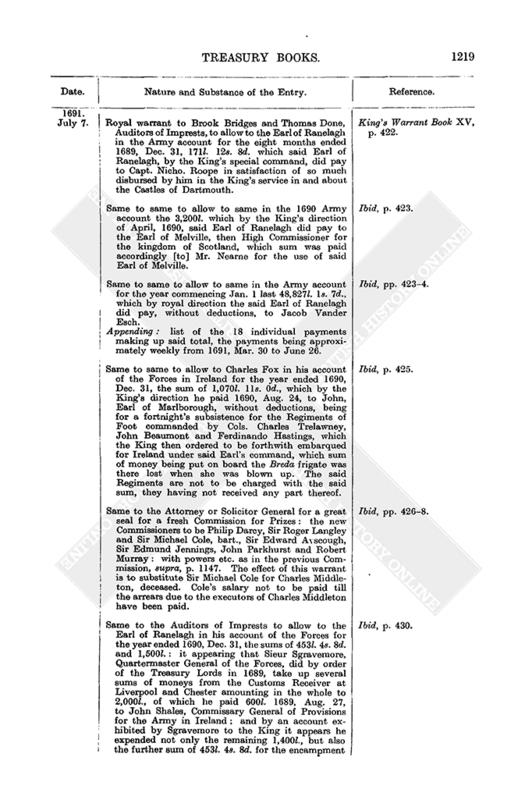 2d., being paid by said Earl of Ranelagh as follows : viz. : 4,501l. 14s. 0d. to Col. Charles Churchill's Regiment, 4,501l. 19s. 0d. to Col. John Hales's Regiment and 4,291l. 18s. 2d. to Col. Sir David Coljear's Regiment : the said Regiments being placed on the English establishment and cleared to 1690, May 1, but since that time they having been employed in Ireland, but said Earl of Ranelagh has paid them the abovesaid sums upon account from 1690, May 1, to the time of their embarquing for Ireland. Ibid, p. 432. Same to same to allow to same in his Army account beginning Jan. 1 last the sums of 14,769l. 17s. 0d. and 14l. paid by said Earl of Ranelagh as follows : viz. : William Van Schulenburg, of the Hague, has paid at several times to Roger Sizer, deputed for that purpose by the Earl of Ranelagh, 278,354l. 5s. 0d. for the use of the English Forces in Flanders, as appears by said Schulenburg's accounts thereof transmitted to the Treasury Lords : and for his repayment and the reimbursement of his charges "which he pretends he was at for the exchange thereof and otherwise" the said Schulenburg received in money from the said Earl 2,800l. and did further, by himself or George Clifford, his correspondent, draw bills on said Earl of Ranelagh for the sum of 290,324l. 2s. 0d., making altogether 293,124l., which exceeds the said 278,354l. 5s. 0d. by the said sum of 14,769l. 17s. 0d., which is judged reasonable to be allowed to said Earl in his account, "notwithstanding [the fact that] the said Schulenburg hath not yet given such satisfaction to the Commissioners of our Treasury as is necessary to show how the said charges amount to the said sum of 14,769l. 17s. 0d." 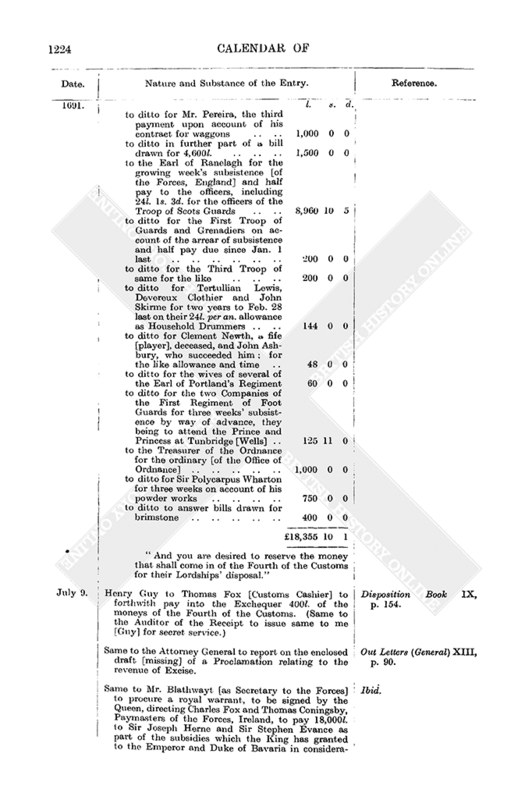 : and further secondly the Earl of Ranelagh affirms that he paid the further sum of 14l. to said Schuylenburg on account of charges on the said 2,800l., which is not included in any of the sums in the schedule below. Appending : schedule of said bills drawn by Schuylenburg and Clifford (31 bills dated from 1689, May 2, to 1691, May 11 : total, 290,324l. 2s. 0d.). Ibid, pp. 433-4. Henry Guy to the Earl of Ranelagh. Hasten your report on the petition of Mr. Conyers referred to you some time since. Out Letters (General) XIII, p. 88. Same to the Customs Commissioners, enclosing (a) and (b) infra. Do as therein desired if you have no objections to offer thereto. Appending : (a) note of a letter [to the Treasury Lords] from [Secretary] the Earl of Nottingham, dated June 25, with an extract of a letter from Dover concerning some goods landed near Dunge ness and seized by Mr. Devereux. (b) Same of a same from same, dated July 4, recommending Edward Harrison to be a riding surveyor at Dover and for a reward to William Minter, a fisherman who was instrumental in the above seizure. Ibid. Same to Sir William Leveson Gower "at Trentham [to be delivered] by the Stone. [Post Office] bag in Staffordshire." On reading your letter of the 4th inst., my Lords ordered a copy of the paper, therein desired, to be sent to you. I enclose it herewith [missing]. Ibid, p. 89. 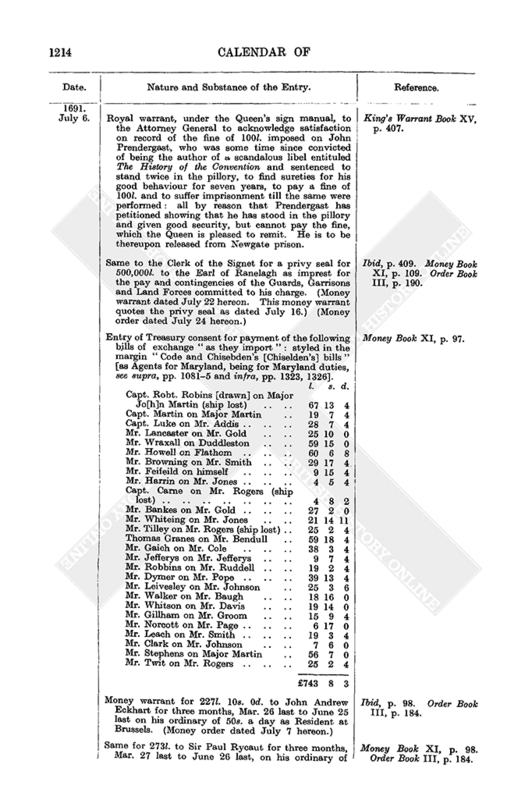 Same to Mr. Blathwayt to procure royal warrants, to be signed by the Queen, to authorise Charles Fox and Thomas Coningsby, Paymasters of the Forces in Ireland, to pay the following particulars : viz. : Ibid. Henry Guy to the Auditor of the Receipt to issue as follows the 270l. which on June 26 last, supra, p. 1203, was ordered to be reserved out of the 2s. Aid and Additional 12d. Aid, together with 50l. more of the said moneys, making 320l. in all, viz. : to Susanna Wosencroft et al., ut supra, p. 1217. Disposition Book IX, p. 151. Same to the Customs Commissioners to pass, Customs free, some arms arrived here with a Danish officer, being for two Regiments of Horse now in Ireland. Out Letters (General) XIII, p. 89. Same to the Auditor of the Receipt. The Treasury Lords notice that there are divers payments comprehended in the account of secret services which might more properly be placed on the [head of] account of bounties in the Exchequer, and that the reason why the said payments have hitherto been made out of the moneys issued for secret services was only to ease the persons who received the same (many of them being very poor) from paying the high fees which in strictness are due. It is resolved that for the future such payments shall be made at the Exchequer to the said persons in their own names ; but nevertheless it is intended that it should be done with as little charge to them as may be. My Lords therefore desire you to give order that such poor persons who have usually been paid his Majesty's bounty out of moneys appointed for secret service and such others whose circumstances you shall judge to deserve mitigation in this behalf may for the future receive their moneys at the Exchequer upon payment of no more fees than if they had been [paid] out of secret service [and this is to rule] throughout all the offices in the Receipt "if you have no objection thereunto." Ibid. Treasury reference to the Customs Commissioners of the petition of James Willson, collector of Bridlington port, praying a discharge of 7l. 2s. 11d. surcharged on him for collecting [duty on] wine from Dunkirk as Rhenish [wine]. Reference Book VI, p. 325. Same to the Agents for Taxes of the petition of Ephraim Sandford for an allowance for his extraordinary charges in receiving and paying the moneys of the 3s. Aid [2s. Aid and Additional 12d. Aid] for co. Westmorland. Ibid. Same to the Customs Commissioners of the petition of Anthony Thorold to the Queen, praying to be discharged of a debt of 485l. which he owes on account of Customs [collection] in regard he has not been allowed any salary on account of his collection in Lyme port. Ibid, p. 326. 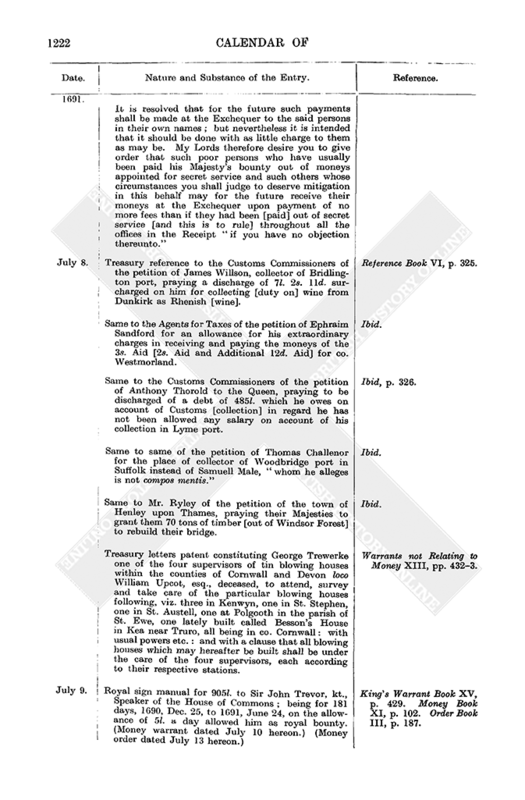 Same to same of the petition of Thomas Challenor for the place of collector of Woodbridge port in Suffolk instead of Samuell Male, "whom he alleges is not compos mentis." Ibid. Same to Mr. Ryley of the petition of the town of Henley upon Thames, praying their Majesties to grant them 70 tons of timber [out of Windsor Forest] to rebuild their bridge. Ibid. Treasury letters patent constituting George Trewerke one of the four supervisors of tin blowing houses within the counties of Cornwall and Devon loco William Upcot, esq., deceased, to attend, survey and take care of the particular blowing houses following, viz. three in Kenwyn, one in St. Stephen, one in St. Austell, one at Polgooth in the parish of St. Ewe, one lately built called Besson's House in Kea near Truro, all being in co. Cornwall : with usual powers etc. : and with a clause that all blowing houses which may hereafter be built shall be under the care of the four supervisors, each according to their respective stations. Warrants not Relating to Money XIII, pp. 432-3. Royal sign manual for 905l. to Sir John Trevor, kt., Speaker of the House of Commons ; being for 181 days, 1690, Dec. 25, to 1691, June 24, on the allowance of 5l. a day allowed him as royal bounty. (Money warrant dated July 10 hereon.) (Money order dated July 13 hereon.) King's Warrant Book XV, p. 429. Money Book XI, p. 102. Order Book III, p. 187. Royal warrant, under the Queen's sign manual, to the Attorney General to enter a noli prosequi to the proceedings against Richard Teale of Cheltenham, who at the Lent Assizes for co. Gloucester in 1689-90 was fined 360l. for planting tobacco in said county : he being a very poor man not worth 5l., but truly loyal, and did it ignorantly, not knowing the laws, and the tobacco having been spoiled by the officers before it came to perfection. He is to give security not to offend in the like for the future. King's Warrant Book XV, pp. 429-30. Money warrant for 650l. to the executors of Lady Mary Howard for 3¼ [sic] years to June 24 last on her annuity of 200l. granted by Charles II. Money Book XI, p. 100. Treasury warrant dormant to the Customs Cashier to pay the salary of 365l. per an. from time to time to William Cheyne, Sir John Knatchbull, bart., and Sir William Pulteney, kt., as Commissioners of the Privy Seal. Ibid, p. 101. Henry Guy to the Auditor of the Receipt to issue as follows out of the Exchequer : viz. : Disposition Book IX, pp. 152-3. Out of the abovesaid 9,045l. so reserved. Out of 254l. 13s. 7d. of the First Poll, 151l. 4s. 6d. of the Second Poll, 21l. 7s. 2d. of the Additional Poll, 14,653l. 1s. 0¾d. of the Double Excise, 1,377l. 8s. 6d. of Letter money, 75l. 13s. 5d. of Tenths, 144l. 16s. 9½d. of the first 12d. Aid and 100l. 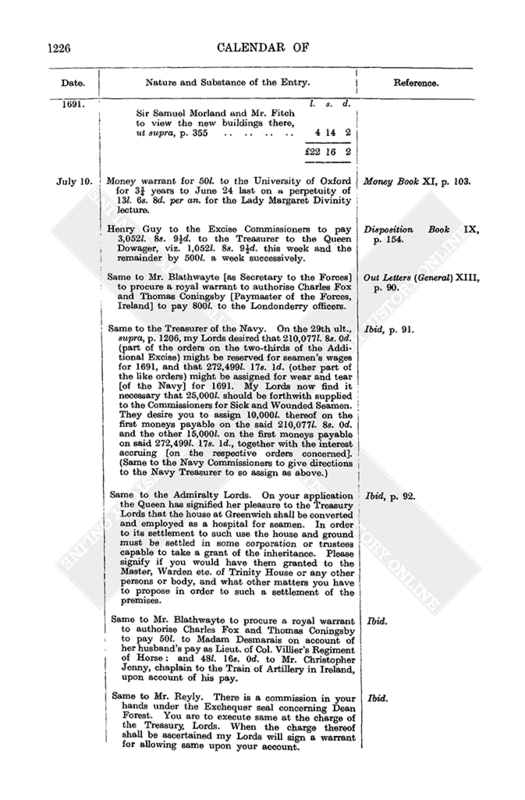 of loans on the Wine Duty Continuing Act, or 16,778l. 15s. 0¼d. in all. "And you are desired to reserve the money that shall come in of the Fourth of the Customs for their Lordships' disposal." Henry Guy to Thomas Fox [Customs Cashier] to forthwith pay into the Exchequer 400l. of the moneys of the Fourth of the Customs. (Same to the Auditor of the Receipt to issue same to me [Guy] for secret service.) Disposition Book IX, p. 154. Same to the Attorney General to report on the enclosed draft [missing] of a Proclamation relating to the revenue of Excise. Out Letters (General) XIII, p. 90. Same to Mr. Blathwayt [as Secretary to the Forces] to procure a royal warrant, to be signed by the Queen, directing Charles Fox and Thomas Coningsby, Paymasters of the Forces, Ireland, to pay 18,000l. to Sir Joseph Herne and Sir Stephen Evance as part of the subsidies which the King has granted to the Emperor and Duke of Bavaria in consideration of marching their troops to the assistance of the Duke of Savoy. Ibid. Treasury reference to the Customs Commissioners of the petition of [certain] West India merchants and planters concerned in and trading to their Majesties' Plantations in America, praying that they may only pay 2s. per cwt. Customs for the new duty of ginger of the English Plantations in America besides the old duty of 1s. per hundred(weight). Reference Book VI, p. 325. 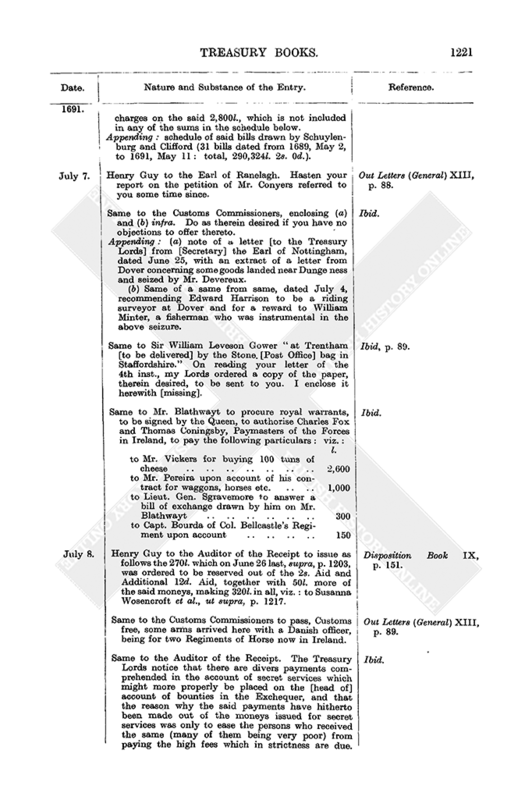 Same to same of the petition of George Simpson for the next vacancy of a coastwaiter, London port. My Lords recommend him for same. Ibid, p. 326. Royal warrant to the Lords Justices, Ireland, to pay 400l. to Sir Robert Staples, bart., for 20 ton of iron which, by order of the Duke of Schonberg of 1690, April 11, he delivered to Robert Ayleway, Comptroller of the Train of Artillery in Ireland, for the use of the said Train : it being certified by Thomas Coningsby, esq., that good bar iron was usually sold in and about the headquarters in Ulster at that season for 20l. the ton. Out Letters (Ireland) VI, p. 79. Henry Guy to the Solicitor General. 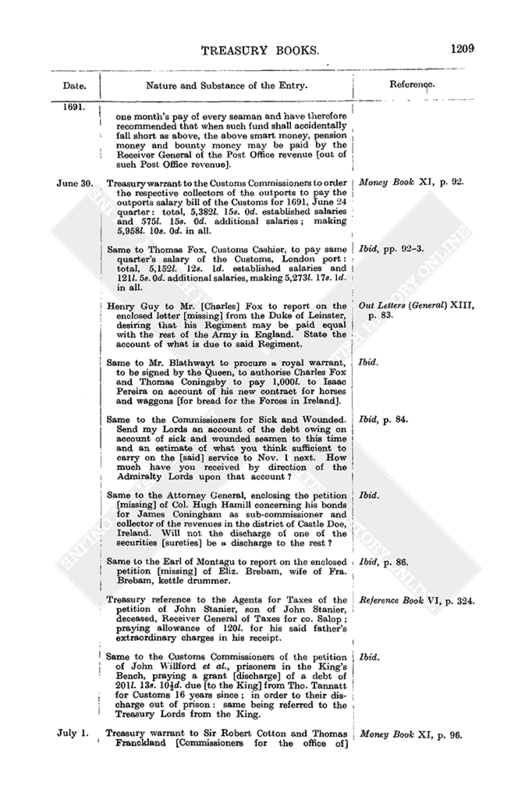 In the signed bill, supra, p. 1219, for appointing Sir Michael Cole, kt., to be a Commissioner for Prizes loco Charles Middleton, lately deceased, the said Cole is wrongly described as a baronet "and therefore taking the third place" in the commission. Please rectify this in drawing the bill and insert him as a knight "next after Sir Edmd. Jennings, kt." King's Warrant Book XV, p. 428. Royal sign manual for 500l. to William Wake, Dr. of Divinity, and 300l. to Isabella, Countess of Mountrath, as royal bounty. (Money warrant dated July 10 hereon.) (Money order dated July 13 hereon.) Ibid, p. 431. Money Book XI, p. 103. Order Book III, p. 187. 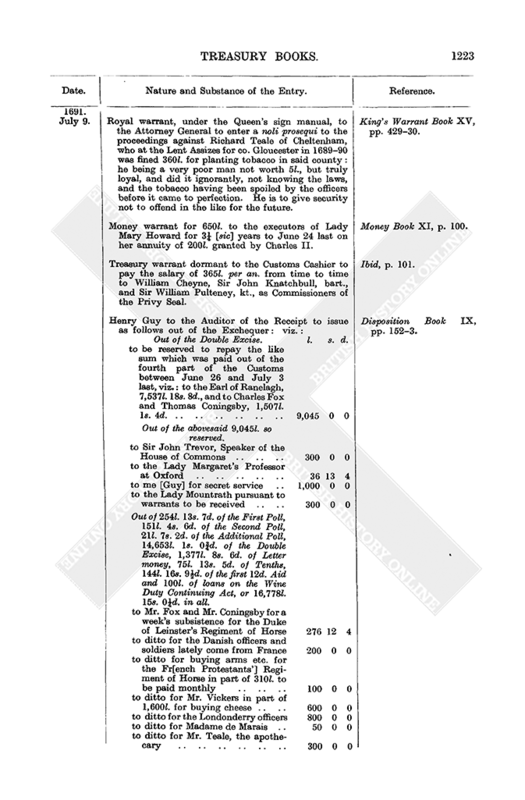 Treasury warrant to Auditor Anthony Parsons to give allowance as follows to Phillip Ryley [Surveyor General of Woods, Trent South] in his account of wood sales in the Forest of Dean, co. Gloucester : viz. : Money Book XI, pp. 101-2. Money warrant for 50l. to the University of Oxford for 3¾ years to June 24 last on a perpetuity of 13l. 6s. 8d. per an. for the Lady Margaret Divinity lecture. Money Book XI, p. 103. Henry Guy to the Excise Commissioners to pay 3,052l. 8s. 9½d. to the Treasurer to the Queen Dowager, viz. 1,052l. 8s. 9½d. this week and the remainder by 500l. a week successively. Disposition Book IX, p. 154. Same to Mr. Blathwayte [as Secretary to the Forces] to procure a royal warrant to authorise Charles Fox and Thomas Coningsby [Paymaster of the Forces, Ireland] to pay 800l. to the Londonderry officers. Out Letters (General) XIII, p. 90. Same to the Treasurer of the Navy. On the 29th ult., supra, p. 1206, my Lords desired that 210,077l. 8s. 0d. (part of the orders on the two-thirds of the Additional Excise) might be reserved for seamen's wages for 1691, and that 272,499l. 17s. 1d. (other part of the like orders) might be assigned for wear and tear [of the Navy] for 1691. My Lords now find it necessary that 25,000l. should be forthwith supplied to the Commissioners for Sick and Wounded Seamen. They desire you to assign 10,000l. thereof on the first moneys payable on the said 210,077l. 8s. 0d. and the other 15,000l. on the first moneys payable on said 272,499l. 17s. 1d., together with the interest accruing [on the respective orders concerned]. (Same to the Navy Commissioners to give directions to the Navy Treasurer to so assign as above.) Ibid, p. 91. Same to the Admiralty Lords. On your application the Queen has signified her pleasure to the Treasury Lords that the house at Greenwich shall be converted and employed as a hospital for seamen. In order to its settlement to such use the house and ground must be settled in some corporation or trustees capable to take a grant of the inheritance. Please signify if you would have them granted to the Master, Warden etc. of Trinity House or any other persons or body, and what other matters you have to propose in order to such a settlement of the premises. Ibid, p. 92. Same to Mr. Blathwayte to procure a royal warrant to authorise Charles Fox and Thomas Coningsby to pay 50l. to Madam Desmarais on account of her husband's pay as Lieut. of Col. Villier's Regiment of Horse ; and 48l. 16s. 0d. to Mr. Christopher Jenny, chaplain to the Train of Artillery in Ireland, upon account of his pay. Ibid. Same to Mr. Reyly. There is a commission in your hands under the Exchequer seal concerning Dean Forest. You are to execute same at the charge of the Treasury Lords. When the charge thereof shall be ascertained my Lords will sign a warrant for allowing same upon your account. Ibid. Henry Guy to the Earl of Ranelagh to report on the enclosed petition [missing] of Col. John Gibson, Lieut. Governor of Portsmouth, praying payment of 193l. 10s. 0d. by him expended for coal and candle for the soldiers there ; and also a letter [missing] from the Earl of Nottingham for subsistence for the gunners there. Out Letters (General) XIII, p. 93. Treasury reference to Mr. Harbord [Surveyor General of Crown Lands] of the petition of Ralph Sanderson for renewal of lease of some lands in Eastcombe, near Greenwich. Reference Book VI, p. 326. Entry of Treasury caveat on behalf of Capt. Ralph Sanderson, tenant of certain [the above] lands in Eastcombe, near Greenwich, that no grant thereof pass till he be heard. Notice to be given to Mr. John Whitley at his house in Goodmans Feilds. Caveat Book, p. 24. The Treasury Lords to Sir Basill Dixwell, bart., Auditor of Excise ; expressing approval of George Brewer as his deputy in said office. Warrants not Relating to Money XIII, p. 431.